Laurie Veldheer as Cinderella in “Into The Woods.” Photo by Joan Marcus. 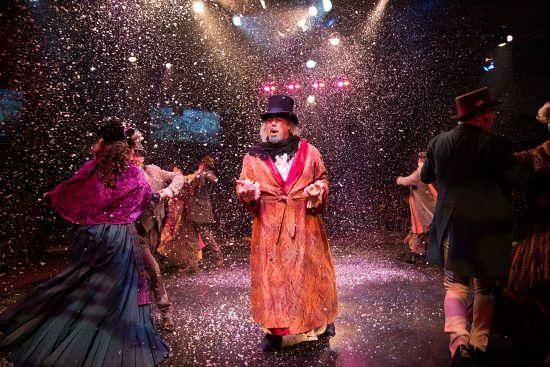 “Anything can happen in the woods.” This is the promise, and premise, of the much-loved musical “Into the Woods,” and the new production by the Fiasco Theatre more than delivers. Heavy on manic comedy, while retaining the dramatic weight of James Lapine’s book, this incarnation accomplishes the feat of being intellectually, visually, and emotionally satisfying in equal measure. Lapine’s book and Stephen Sondheim’s lyrics take us on a journey to a fairytale land with some easily recognizable characters; Jack (of the beanstalk), Red Riding Hood, Cinderella, a Witch, with a Baker and his wife thrown in (the latter are original characters). Each group receives a mission that sends them into the titular woods where they meet some other familiar faces (Rapunzel, the (Big Bad) Wolf, some charming princes). They find and lose the path, literally and metaphorically, and claiming their “happy ever after” turns out to be just the beginning of the story. …an enchanting blend of music and magic that reminds us how vital fairytales still are. 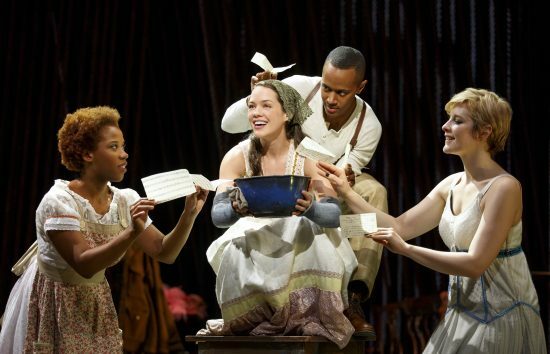 Ben Steinfeld and Noah Brody’s impressive new staging of the story is refreshing and delightful. The set, courtesy of Derek McLane, teases the whimsical deconstruction of the directors’ vision before the performance begins: pianos are actually deconstructed, the shells hanging from the ceiling, keys framing the stage. Sparkling chandeliers contrast with rustic furniture and scattered instruments, all against a backdrop of cascading ropes that stand in for the trees. Whitney Locher’s simple costumes pair well with the surroundings; for the women, Anthropologie-type vintage dresses and shawls, and a collection of tweed and suspenders for the male characters. The simple costumes are needed, as the pared-down cast all play multiple roles, including the Narrator of the story. The reduced company is responsible for many of the laugh-out-loud moments in the production. Anthony Chatmon II and Darick Pead are the comic forces of the show, partnering as both the preening princes, as well as the giggling stepsisters of Cinderella. Their performance of the princes’ ego-tastic duet, “Agony,” is predictably hilarious. The production adds its own absurdist humor by casting Mr. Pead as Jack’s doomed cow, Milky-White. While Christopher Akerlind’s wonderful lighting design helps to signal scene changes, the lightning-fast character swaps are sometimes marked only by a change of voice and an eyebrow raise. The hilarity is balanced by the sincerity of the Baker (Evan Harrington, bewildered but honest) and his wife (Eleasha Gamble, bold and brave), whose story is the heart of the show. The actors convincingly portray the mutual affection of husband and wife, who are searching in the woods for a way to lift a curse. This emotional center is flanked by the malicious (and misunderstood) Witch, embodied by Vanessa Reseland. Ms. Reseland struts and swoops around the stage, by turns powerful and perverse, delivering some of the most compelling musical numbers in the show. Her range soars from plaintive (“Stay with Me”) to aggressive (“Last Midnight”). Lisa Helmi Johanson (Red Riding Hood), Philippe Arroyo (Jack), Laurie Veldheer (Cinderella), and Bonne Kramer (Jack’s Mother) round out a solid company. The breakneck ensemble piece, “Your Fault,” is one of the many numbers that underscores the incredible vocal agility of the cast. As suggested by the set design, the orchestra is also deconstructed, with actors doubling as musicians. Evan Rees provides expert accompaniment on piano, the instrument which becomes the unifying space on stage. Ms. Kramer’s bassoon is particularly fine, adding some unsettling harmonies to the action. A very few times, the instruments overwhelm the voices, but overall the simplicity and immediacy of the instrumentation let the vocal performances shine right through to the sweetly poignant ending. “Into the Woods” is a grown-up fairytale because it reminds us that the best stories are not about happy endings but about the journey. This stylish reinvention keeps faith with the original production: it breaks apart a familiar story and makes it new again. “Into the Woods” is an enchanting blend of music and magic that reminds us how vital fairytales still are. Advisory: Recommended for ages 8 and up. Running Time: About 2 hours and 40 minutes, with a 20-minute intermission. “Into the Woods” plays through January 8, 2017, at the Eisenhower Theatre (Kennedy Center), Washington, DC. For more information and tickets, contact (202) 467-4600 or click here.